Stylish, affordable and reliable, Timex watches offer a slice of the American dream to everyone. Founded in 1854 in Conneticut’s Brass City, the brand has long established itself as one of the world’s leading watchmakers, with several iconic collections that have defined entire generations. The Indiglo with its distinctive electro blue glow is as popular today as it was when first debuted in 1992, while the high-performance Metropolitan IQ Move is designed to help you go the distance. 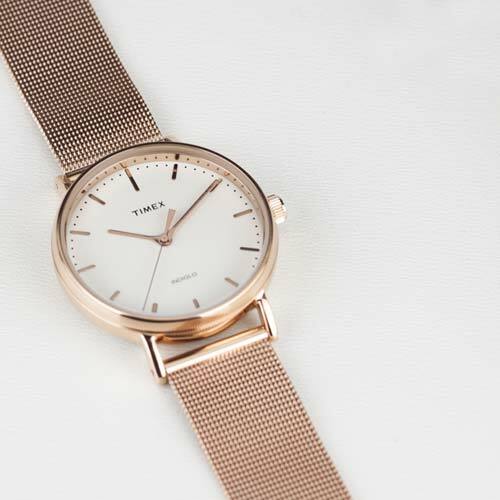 From classic, vintage-inspired pieces to contemporary designs that channel the latest trends, Timex is confident, classy, and always cool - a timeless choice, every time. Timex unleashed its first Indiglo watch in 1992 and watch enthusiasts were instantly hooked. Whether you choose a chunky, shock-proof chronograph or the stylish and understated Fairfield, the unmistakable electric blue glow tells you it’s an Indiglo. Designed to make you look good when it’s time to unwind, the Weekender collection features the ultimate accessories for your casual best. Whether you go preppy with multi-coloured stripes, understated with an ice-white dial and tan leather bracelet, or show your playful side with beloved beagle Snoopy, the Weekender collection is all about you. 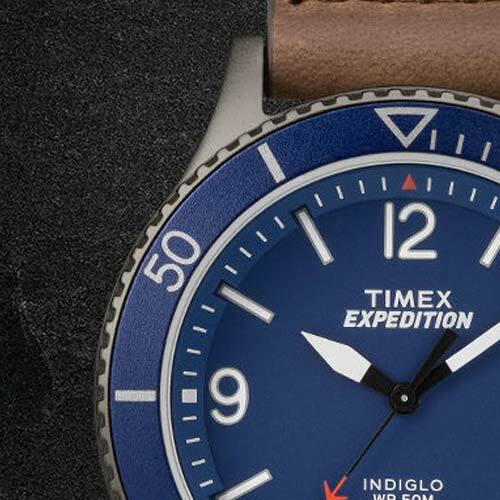 The Timex Expedition collection is all about adventure. Combining stylish aesthetics with practical features, such as the fly-back chronograph or super-precise Ironman, the range is aimed at men and women who like to live life on the edge. Founded in Brass City in 1854, the brand we now know as Timex started out selling affordable clocks to the masses. To this day, the brand continues to pioneer affordable quality in its timepiece collections. 1914 : The ground-breaking strap watch is launched, which quickly overtakes the pocket watch in sales and popularity. 1941 : Dutch businessman Thomas Olsen purchases The Waterbury Clock Co. and combines the names of Time magazine and Kleenex tissues to create Timex. 1950 : Timex launches the V-Conic, the world’s first quality mass-produced watch. 1984 : Timex enters the digital era with gusto with the release of the Ironman wristwatch. 1992 : Timex releases another iconic timepiece – the backlit Indiglo Night-Light. 2001 : Timex is named ‘the most loved brand’ in the US. 2016 : Timex launches its handsome hybrid watch, the IQ Move. Timex is the all-American brand that captured the world’s imagination and made time accessible to everyone. With over 150 years in the business, Timex has the wisdom to evolve effortlessly with the times, producing stylish collections that look classy and promise quality. Approved by everyone from Mark Twain to Mark Wahlberg, Timex has adorned the wrists of many great men, women, and children over its lengthy lifespan. Whether you choose a smart everyday model, a digital chrono, or a stylish dress watch, Timex has something that you can rely on to look effortless at every occasion.